142 Crooked Creek Marina Road Lobelville vicinity Tennessee River Mile 120.8 931 593-2112 Open Year-Round From Lobelville From downtown Lobelville, head north on Main Street (Tennessee 13) and turn left (west) onto 4th Ave W which becomes Crooked Creek Road. In 10.4 miles, turn left (S) onto Lower Crooked Creek Road/Pineview Road, and in .4 mile, turn hard right (W) onto Britt Road. Go 1.8 miles and turn right (W) into Crooked Creek Marina Road. 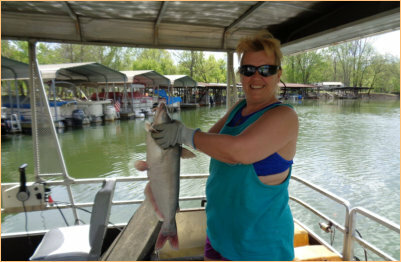 It’s always River Time at the Crooked Creek Marina! 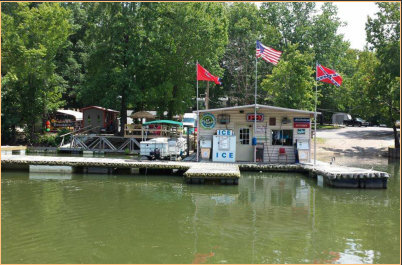 Welcome to the only full-service marina on the Tennessee River in Perry County. We’re located in a protected embayment just off the main channel of the Tennessee. We have open and covered slips, marine fuel, a convenience store with courtesy dock stocked with cold beer, groceries, fishing bait and supplies, as well as a boat ramp for launching. Our Burger Shack is known up and down the river for great food. Come order a 1/3 pound burger and watch it cooked on an outdoor grill right before your eyes. We also offer sandwiches, pizza, snacks, Sno-Cones and everyone’s favorite, hand-dipped ice cream! Bobby and the staff know this part of the Tennessee better than anyone and are eager to help you have a great day on the river. It’s always River Time at the Crooked Creek Marina! The only full-service marina in the county offers covered slips, marine fuel and awesome food at the marina’s Burger Shack!